Dedication. List of Contributors. 1. Ground Water Quality Concerns About Nitrogen (R.F. Follett, D.J. Walker). Introduction. Health concerns. Human toxicity. Economic concerns. Economic concepts. Problem nature and implications for solution. Public policy options. Resource conservation concerns and issues. References. 2. Sources of Nitrate to Ground Water (D.R. Keeney). Introduction. Nitrogen cycling. Natural sources of nitrate. Geologic nitrogen. Forests. Forage and pasteral agriculture. Waste materials. Animal wastes. Sewage sludge and effluent. Septic tanks. Row crops agriculture. Irrigated agriculture. Summary. References. 3. Nitrate in Ground Water in the United States (G.R. Hallberg). Introduction. Nitrate, agriculture and ground water. Nitrate and water quality: a national overview. Comparisons with state data. Surface water and ground water. Nitrate distribution and variability. Depth distribution. Spatial variability and depth distribution. Spatial variability: land use and local sources. Temporal variations. Depth and time. Denitrification and time. Nitrate variability among wells. Summary and conclusions. References. 4. Ground Water Nitrate in Other Developed Countries (Europe) - Relationships to Land Use Patterns (S. Juergens-Gschwind). Introduction. Impact of bare land. Impact of forestry. Impact of grassland. Cut grassland (meadowland). Grazed grassland. Impact of arable crops. Depending on crop type. Depending on type of soil. Depending on rainfall and irrigation. Depending on temperature. Depending on ground water level and drainage. Depending on rate, timing and form of fertilizer use. The impact of horticulture. Intercropping and green manuring. Irrigation. Home and hobby gardens. References. 5. Nitrate Transport and Leaching Mechanisms (W.A. Jury, D.R. Nielson). Introduction. Nitrate transport mechanism. Convection. Diffusion. Hydrodynamic dispersion. Removal and reaction mechanisms. Plant uptake. Denitrification. Spatial variability and the transport problem. Models for characterizing leaching. Process models. Stochastic models. Spatial variability and the modeling problem. Uncertainty in modeling transport to ground water. Summary and conclusions. References. 6. Proper Accounting for N in Cropping Systems (J.F. Power, F.E. Broadbent). Introduction. Crop N requirements and yield goals. Contrubitions to residual soil N. Soil tests and residual nitrates. Management practices and N accounting. Mineralization and immobilization. Organic-inorganic interchange of N in soils. Kinetics of immobilization and mineralization. Factors influencing immobilization. Influence of environmental factors on immobilization and mineralization. Predicting N mineralization. Conceptual models of mineralization and immobilization. Conclusions. References. 7. Fertilizer Nitrogen Management (G.A. Peterson, W.W. Frye). Introduction. Importance of N fertilizer to agriculture. Amount of fertilizer-N to apply. Yield goals. Soil tests. Soil sampling. Tissue tests. Fertilizer N carriers. Anhydrous ammonia. Urea. Ammonium nitrate. Urea - Ammonium nitrate solution. Ammonium sulfate. Ammonium phosphates. Application methods and timing for nitrogen fertilizers. Method of application. Method of application as related to source. Method of application as related to timing. Relative efficiency of materials as affected by method and time of application. Leaching of nitrate. Amount to apply. Time of application. Nitrification inhibitors. Scavenger cover crops. Denitrification. Ammonia volatilization. Nitrification. Immobilization. Nitrogen stabilizers. Nitrification inhibitors. Urease inhibitors. Conclusions and recommendations. References. 8. Estimation of N Budgets for Crops (J.S. Schepers, R. H. Fox). Introduction. Inputs. Precipitation. Irrigation. Fertilizers. Manure N. Symbiotic N fixation. Non-symbiotic N fixation. N mineralization. Outputs. Crop N uptake. Ammonia volatization. Erosion losses. Denitrification. Leaching. References. 9. Impact of Soil Management Practices on N Leaching (G.W. Thomas, M. Scott Smith, R.E. Phillips). Introduction. Tillage practices. Overview of types of tillage practices used. Effects of tillage on soil water regimes. Effects of tillage on nitrogen transformations. Nitrification. Denitrification. Mineralization - immobilization. Climate. Rainfall and evapotranspiration. Temperature. Soil management of water and its effect on leaching. Irrigation. Artificial drainage. Winter cropping. References. 10. Cropping Systems: Ecology and Management (M.P. Russelle, W.L. Hargrove). Introduction. General concepts. Ecological approaches to nitrogen management. Nitrogen balance in agriculture systems. Monoculture. Planting geometry and date. Tillage and residue management. Irrigation. Cover crops. Nonleguminous cover crops. Leguminous cover crops. Interannual rotations. Nitrogen deposition in soil by legumes. Nitrate losses during legume growth. Nitrate losses after legume growth. Plant residue decomposition. Management considerations. Mixed cropping. Nitrogen cycle. Multiple cropping. Deeply rooted crops. Crop cultivars. Conclusions and recommendations. References. 11. Management of Water Balance Components (D.F. Heerman, H.R. Duke, J. van Schilfgaarde). Introduction. Applied water. Evaporation and transpiration. Runoff. Percolation. Management of water application. Uniformity of water application with an irrigation system. Controlling depth of water application. Water table control. Irrigation scheduling for replacement. Determining when and how much water to apply. Constraints of water delivery systems. Irrigation scheduling to manage leaching. Runoff control. Irrigation system operation. Tillage and residue management. Management of percolation. Leaching requirement. End of season water management. Drainage. Managing the drainage water. Application of chemicals with irrigation water. Uniformity considerations, Application depth. Equipment safety and design. References. 12. Linkages with Ground Water (H. Bouwer). Deep percolation rate.s Water content. Pore velocity and preferential flow. Dispersion. Nitrate concentration. Perching and lateral flow. Arrival at ground water. Water treatment. References. 13. Transformations and Movement of Nitrate in Aquifer Systems (R.R. Lowrence, H.B. Pionke). Introduction. Processes affecting nitrate concentration in aquifer systems. Process interaction in heterogeneous aquifer systems. Case studies of local and regional aquifers. The Lincolnshire limestone and chalk aquifers in eastern England. Coastal plans Riparian aquifers. Auob sandstone aquifer, Namibia. Fluctuating shallow water tables in northern Europe. Shallow sand aquifers, Ontario, Canada. Potential for restoration of nitrate contaminated aquifers. References. Subject Index. Supplying crops with adequate nitrogen is vital to ensuring food supplies. Once nitrogen is added to the soil, it is subject to chemical transformations of the nitrogen-cycle including transformation to nitrate. Excessive amounts of accumulated nitrate may then leach out of the soil and could potentially enter and contaminate drinking water supplies. 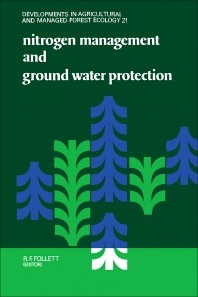 The purpose of this book is to examine the subject of nitrogen management and ground water protection. The issue of maintaining ground water quality is addressed primarily from an agronomic point of view. Topics covered include: health and economic aspects of nitrate in drinking water; nitrate sources; ground water nitrate in the USA and other developed countries; transport, leaching and accounting for nitrogen; soil, nitrogen, crop and water management; and nitrate in aquifer systems. The book contains a keyword index and is organized into thirteen chapters, each with appropriate references, tables and figures. Chapter authors are among the leading experts on the subject of nitrate and ground water quality. Readers to whom the book is directed include soil scientists and agronomists, agricultural engineers (irrigation and drainage), environmental scientists, agricultural policy makers, and hydrologists.